Holds up to 4 snowboards comfortably! Also great for skis, surfboards, wakeboards and more! This snowboard rack is perfect solution for your snowboard storage needs. With a beautiful and sleek finish, this snowboard rack will look great in almost any setting. Made from solid American Red Oak, the Timber Rack provides a furniture quality storage solution to show off all your gear. Whether you are looking to save some storage space in your home, garage, shed, lodge, or cabin, the timber wall rack pairs great with any style. Save some space and give those snowboards a sharp look! Never worry about your snowboards getting scratched This rack can support up to 20 lbs on each level, holding even the the biggest boards. With a cork padding inlay on each arm, the rack keeps your boards secure and safe from scratches and from dings. 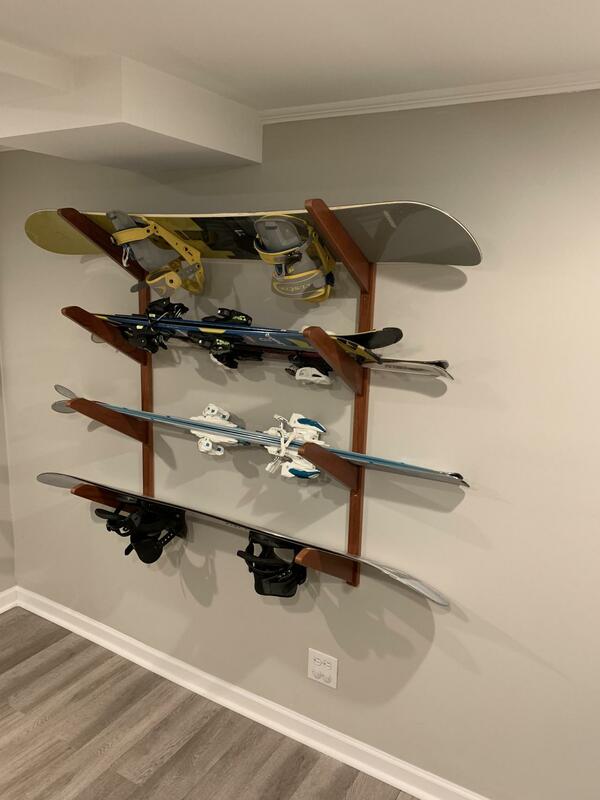 The timber wall rack is also a great storage solution for more of your outdoor gear such as skis, surfboards, wakeboards, and more! Quality construction, holds boards perfectly and was supper easy to install. Looks like I’ll be purchasing another one. Easy to install (used stud finder for 2 main brackets). Looks good too on the wall.